In the last chapter, we introduced the term "elements of design" and it's effect on interior design and home decoration. We have gone over 3 major elements that can significantly affect the look & feel of the room: Space, Line and Color. In This chapter, we will go over the other 4 elements, their features and their best practices. If at this point you already have some ideas for the design of your space, feel free to use Mathew'z Design Notebook. The Design Notebook let's you save products you liked, upload images of designs, sketches, blue prints, wall paints and make notes for your ideas. It can help you organize your ideas and start getting a more clear picture of the design you desire. Texture is the surface/finish of the object, it can refer to a piece of furniture, a decor accessory or wall coverings . For example, in a sofa the finish/cover could have different types of texture. It can either be silky or smooth (linen) or it can be shiny (leather). Texture adds an additional dimension to the design that can suggest on the design style and purpose. Texture is not only about how it looks, but also about how it feels when we touch it. Each texture is constructed of 3 primary features, those features will give the final effect of the texture and it's final appearance in the design of your space. Those features are Visual and Tactile, Light Reflection and Scale. Refer to the amount of light that is reflected from the texture. 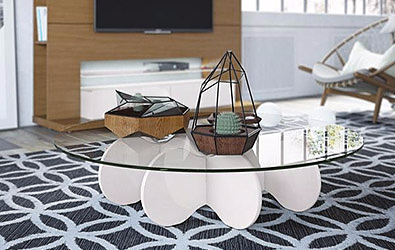 For example, a glass coffee table will reflect more light to than a wood coffee table. In more common words, how the texture looks and how it feels. A brick wall will look and feel different from a standard white wall. A metal and leather bar stool will look and feel different from a wood and velvet bar stool. Scale refers to how heavy the object is perceived to us because of it's texture. For example, a nightstand with a natural wood finish will be perceived much heavier than if the same nightstand will have a finish of white laminate. 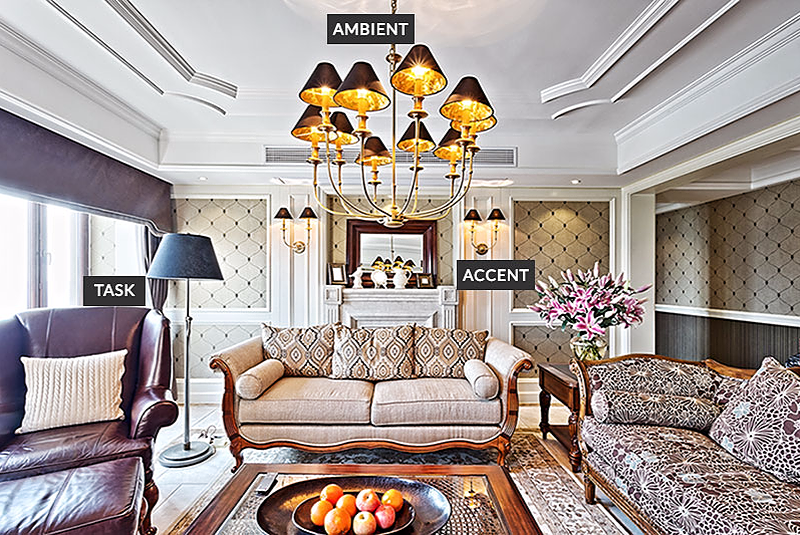 The common textures used in interior design are divided to 2 primary types. The division of types according to the textures characteristics and features, organize and ease to fit the texture of objects according to the desired design styles and appearance. Feel more solid and 'rustic'. Create a more modern look. Pattern is defined as the repetition of line, shape form, texture and color in different objects in the design space. Some design styles make an excessive use of patterns in the room design, while others doesn't use patterns at all. Whether you choose to use pattern or not in your interior design mainly depends on the design style you choose and your personal preference. Design with no patterns create a clean and elegant appearance, that can suggest formality and stability, but it can also be dull. 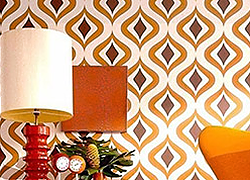 Design with patterns can add an more interest to the design and look more 'alive'. However, overuse of patterns can create confusion and discomfort to the eye. The most commonly used pattern type in Interior design. Motifs refer to randomly recurring patterns, usually based on abstract types of objects. Using recurring pattern can create a better flow to the eye and sense of continuity. The pattern or mix of patterns used in the design should fit in colors to to the other objects in the room. That means that prior to choosing patterns, you should decide the color scheme and color combination used in your design. The pattern objects can also have neutral colors or mix of neutral and color from your color scheme. It's also recommended to choose one dominant color and one fabric type who will be used for each pattern. Keep balance when using patterns. Too much objects with patterns or the use of too much patterns can create over stimulation and discomfort to the eye. Make sure to use pattern with the correct touch. You can be bold and daring, but still have a balanced use of patterns. Form is defined as the three dimensional shape of an object. 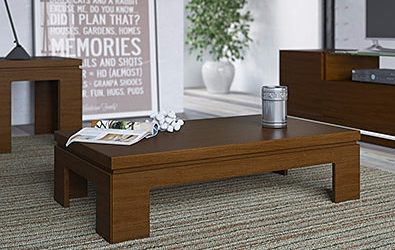 For example, a dining table can have a rectangular form, or an oval form. Like other elements, form is used to create different feeling in the space you design, as well as suggest the style and purpose. This refers to geometric forms, like squares, rectangular, triangles and etc... Man made form create a sense of stability, formality and elegance. Refers to organic forms, that can also be found in nature. Curved, uneven and distorted shapes are examples of natural forms. This type of forms is more comfortable to the eye and create a sense of harmony in the space. Depend on the room design style and purpose, we can either use a mix of both form types or use only one form type. the general idea is to balance between the form types to get the desired outcome. Light is the last element of interior design. Adjusting the intensity, position and color of light can create a whole new interpretation to the designed space. Light also significantly affect the feeling you get from the room, it can make a room feel intimate, relaxing, bold and externalized or active and playful. Light design is extremely important since even if all other aspects of your interior design are flawless, incorrect design of light could overcome them. Light design should be functional to the purpose and activities of it's room. The position, intensity and type of light should fit to the intended use of the space. For example, a kitchen with intimate low light design might look nice but it will make it difficult for you to perform the necessary tasks usually done in the kitchen. Design correctly with lighting include the correct quantity and position of the light sources, according to the purpose of the room. Not enough light sources and wrong positioning can make it difficult for you to perform the desired activities in the space, also it can create a depressing mood. Too much light sources can cause glare which makes it uncomfortable to the eye. creates the general illumination surrounding the environment. more common term is the general light source which spreading light in the space, like ceiling fixtures and natural day light. Spreading a small illumination light in a specific area, which usually used to perform specific tasks. Good example is a desk lamp or light pendants located under kitchen cabinets. Used to add highlight, drama and focus to interior spaces. This includes directional lighting placed on artwork, decor accents or floor lighting. Unless you would like to create a specific mood to the room (like romantic mood), take the advantage natural day light. Using natural day light in the light design of your room is usually the best light source you can have. Research has already proven in the past that day light has a major impact on our mood and feeling, and the more we're exposed to day light the better we feel. Therefore, using day light in the design of your room will improve the feeling of peace and harmony. Not only that, it's more environmental friendly and best of all, it's free! So if possible, set large windows or glass doors that will expose the room to more day light. Light effects are more common for the use emphasizing specific objects or setting up specific atmosphere to the room. refers to the intensity and spread of the light source. For example, if we would like to set a more romantic mood, we will use low spread lights like dimmers. Less spread of light and more darker locations will set a more romantic feeling to the room. Light color should be used correctly and in the right dosage. Using colors that are too bold or using too much color light sources can create a cheap look or make the eye feel discomfort. For example we can set a more party/night life mood by using floor LED lights or LED strips. Another example is setting a color accent light to emphasize a specific object could give a whole new interpretation to the object. Take our short image quiz that gathers all this chapter subjects. In this part, we learned about the first 3 and most basic elements of interior design: Space, Line and Color. If some of you feel at this point they're not really sure how to put what you read into actual interior design of your space, that's fine. Those are just the fundamentals and the more we progress in the guide, the clearer the picture will become and will make more sense. In the next part, we will learn about the last 4 elements: Texture, Pattern, Shape and Light. This guide was written by Amit Roznak and Mathew'z team .